Pollen, dust, and dirt build up on the exterior of your home over time. Because a garden hose is only about 60 psi, it isn't powerfull enough to remove this buildup. Fontaine Brothers use a commercial size 3700 psi cold water pressure washer with all the right nozzles for the right job. Stubborn stains are removed with a hard bristle brush. 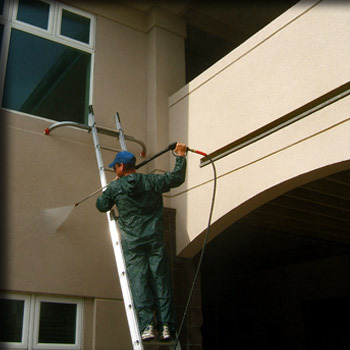 Pressure washing extends the life of your paint and gives your house that new look. So whether you need prep work cleaning before staining a deck or painting your home, or just want to give your whole house a bath, Fontaine Brothers can do the job.